TUCSON, Ariz. – February 6, 2018 – USL Division III welcomed today FC Tucson as its first founding member of the league’s West Coast conference. Recently acquired by the USL’s Phoenix Rising FC, FC Tucson will bring professional soccer to the more than one-million residents of the second-largest city in Arizona. Today’s announcement also marks the first formal affiliation between USL and USL Division III clubs. An in-market announcement celebrating FC Tucson’s move to the new professional league will occur later this year. amassed a record of 53-15-18 in the regular season and 5-5 record in the PDL Playoffs. garnered three PDL Mountain Division Championships (2014, 2015, 2017). secured one PDL Southwest Division Championship (2016). finished as three-time PDL Western Conference Finalists (2014, 2015, 2016). competed in the Lamar Hunt U.S. Open Cup four times (2013, 2015, 2016, 2017). Phoenix Rising FC Governor Berke Bakay leads an ownership comprised of successful and experienced CEOs, private equity financiers, entrepreneurs, real estate experts, surgeons and global leaders in the entertainment industry – including multi-platinum recording artist Diplo, Fall Out Boy’s Pete Wentz and veteran Major League Baseball pitcher Brandon McCarthy. The ownership group also includes Tucson native, Dr. Mark Leber. The successful USL club acquired FC Tucson in October 2017, continuing to reinforce its investment into professional soccer in Arizona. The city of Tucson has experienced the thrill of professional soccer for years, as FC Tucson has hosted an MLS Preseason event, the Mobile Mini Sun Cup, since 2011. The event regularly draws sellout crowds, and is featuring 11 MLS clubs, as well as Phoenix Rising FC, for this year’s tournament at Kino Sports Complex which began with a sell-out crowd on February 3rd and will continue through February 24th. FC Tucson – which currently competes at Kino North Stadium – will anchor the western expansion of USL Division III, as the league grows to a three-conference structure, emphasizing regional rivalries. The club joins South Georgia Tormenta FC, based in Statesboro, Georgia, as a founding member of the new league. Led by Majority Owners Darin and Netra Van Tassell, Tormenta FC has established itself as one of the premier amateur teams across the United States. Tormenta FC recently filed plans to construct a new state-of-the-art 5,000-seat soccer-specific stadium in Statesboro, which will provide an exciting and authentic professional soccer experience for fans and players. FC Tucson, established in 2010, is committed to bringing the highest caliber of competitive soccer to Tucson and establishing a successful and long-lasting source of pride for city, county, state and country. Phoenix Rising FC, which competes in the United Soccer League, owns and operates FC Tucson and runs the Mobile Mini Sun Cup, a Major League Soccer preseason tournament. In 2012, FC Tucson was named the PDL Rookie Franchise of the Year. To stay up to date on what is going on with the Mobile Mini Sun Cup, check out the team’s website at www.fctucson.com. 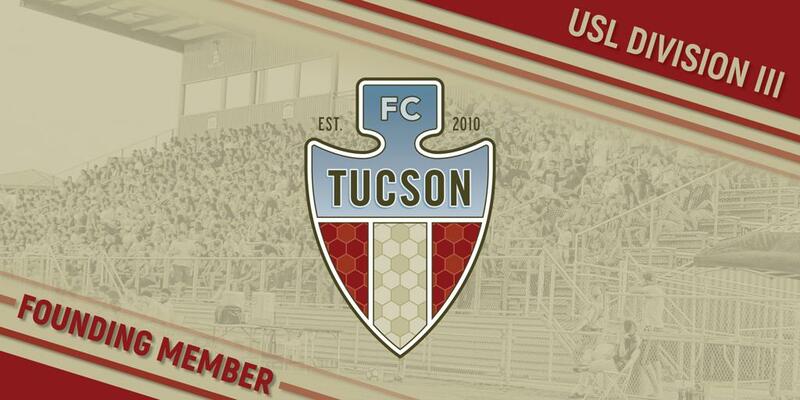 You can also visit the team’s Facebook page and follow all of the news related to FC Tucson on Twitter. USL Division III is shaping the future of the game in the United States, uniting passionate fans in new markets with the thrill of a proven professional soccer experience. Beginning play in 2019, USL Division III has announced South Georgia Tormenta FC and FC Tucson as founding members and will have additional franchise announcements in the coming weeks and months. An official brand launch is also expected later this year.